During a Senate press conference today, CNN’s Dana Bash asked Reid if he would support a bill that would reinstate funding to the National Institutes of Health, including a program providing access to clinical trials for children with cancer. In response, Reid decried the idea that legislators can “pick and choose” which parts of the government should be funded, reiterating his desire for legislation to fully fund the federal government without strings attached. 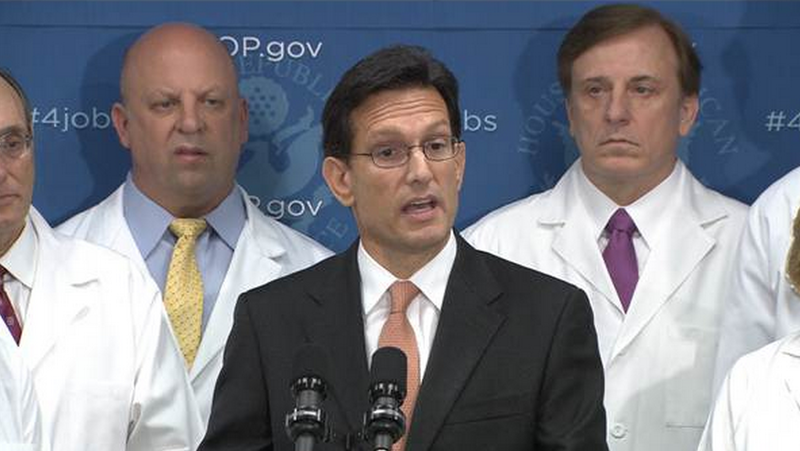 So, Cantor, hoping to strike while the iron was hot, asked every one of his colleagues with a medical background to put on a lab coat and a stethoscope and stand behind him on stage at a hastily-called press conference. If you’re from Louisiana, you may recognize one of the men in costume standing directly behind Cantor: Congressman John Fleming. The (Reid) misquote became instant fodder for the outrage machine. Drudge highlighted it. Fox delighted in it. FreedomWorks incorporated it into its fundraising, under the headline “Harry Reid: No help for cancer kids”. “How out-of-touch and heartless can Senate Democrats be?” the National Republican Senatorial Committee asked. Let’s take a step back and think about this. Let’s pretend that Reid actually did say and mean what he is accused of saying. If I understand this correctly, conservatives believe that this imaginary child with cancer has some kind of right to government-funded health care through NIH, and that the heartless Reid is denying him or her this government-funded treatment. Do I have that right? It gets better: Under sequestration budget cuts that President Obama and his fellow Democrats have begged the Republicans to reconsider, the NIH has been forced to slash $1.7 billion from its 2013 budget. It was forced to cancel 700 research grants to scientists doing cutting-edge work. And it was forced to deny admission to the NIH Clinical Center to some 750 real-life, actual patients. If it is heartless and out-of-touch to deny treatment to one cancer patient, what do you say to a party that denies it to 750? If left unaddressed, sequestration’s impact on the NIH will be even more profound in fiscal 2014. Bookman then turns his attention to the statistics in Georgia, whose Republican Governor, like Louisiana Governor Bobby Jindal, has refused federal funding for the expansion of Medicaid. This is insanity. And having been born and raised in Louisiana’s Fifth Congressional District and with all due respect to my conservative Republican friends, I have yet to encounter a single Republican from Louisiana offering a cogent and informed argument against the implementation of the Affordable Care Act. I don’t need to conduct a poll; it’s obvious: The vast and overwhelming majority of Louisiana Republican voters have no idea what the law actually does, but nonetheless, they oppose it, rabidly. When you really understand what the reforms will do, particularly in a state like Louisiana, when you realize that this is about fixing health insurance, not about the federal government “taking over health care,” when you learn that the entire premise and structure of these reforms were designed by Republicans, that Mitt Romney was essentially forced to run against the single biggest accomplishment in his career, a law that he rightfully promoted as ensuring “individual responsibility,” you’re left with the unsettling truth: The strident Republican opposition to the Affordable Care Act, with few exceptions, is animated by a reflexive antipathy toward President Barack Obama. To be sure, there are many legitimate policy criticisms of particular aspects of the Affordable Care Act, but when you consider the totality of the law, you’d be hard-pressed to find anyone in the Republican Party offering anything more substantive than the rote line about the perils of socialized medicine, which typically begins and ends with anecdotes about wealthy and upper middle class white people in Canada and the United Kingdom not being treated preferentially, like they would be here in the Land of Opportunity. Never mind, for a minute, that Obamacare isn’t really socialized health care and that more than 10% of people who oppose the law believe it doesn’t go “far enough;” Canada and the United Kingdom spend half as much as we do, on a per capita basis, on health care, and they live longer. They are less likely to get diabetes and most forms of cancer, and according to the stats, they are just as likely to survive from cancer and other diseases as the average American. The only real difference is: When an American gets cancer or requires extensive medical treatment, they are vastly more likely to go bankrupt as a result. And it brings me back to Governor Jindal, Congressman Fleming, and the other Republicans representing Louisiana in Washington, D.C..
As I write this, the United States is only hours away from defaulting on our debts. Economists from all over the world and of all different political persuasions believe that an American default could trigger a global economic recession. It could sabotage the pensions of millions of Americans; it could cut the stock market in half; it could force the layoffs of hundreds of thousands of American workers. And for what? Because a small band of radical right-wing reactionaries, people representing the least diverse and almost exclusively rural districts in the country, have attempted to mount a coup against the twice-elected President of the United States, a man who won his most recent election by five million votes on the back of his health care reforms. But that’s not all: Not a single Democrat who ran for re-election in the United States Senate was defeated in 2012; they actually gained seats. And despite the fact that the House of Representatives remained in Republican control, Democrats received a million and a half more votes nationwide. The Tea Party doesn’t represent a tidal shift in American politics; it’s representative of the type of gerrymandering that should be considered criminal. As The Daily Show recently pointed out, Louisiana’s Sixth Congressional District, currently held by Republican Bill Cassidy, is only “safe” for Republicans because it’s been rigged. Republicans will tell you that Louisiana’s Congressional districts are drawn like a Picasso because the Voting Rights Act and subsequent case law requires Louisiana to have at least one “majority-minority” district. But what they won’t tell you is that, when Louisiana lost a Congressional seat after the 2010 Census, Republicans did everything they could to consolidate the majority of African-American voters in the state’s two biggest cities into a single district. Republicans used the Voting Rights Act, which was intended to empower and enfranchise minorities seeking to engage in the political process, as a disingenuous excuse to dilute minority representation statewide. Because the law only requires Louisiana to have one competitive majority-minority district, Republicans concocted a map that connected inner-city Baton Rouge and inner-city New Orleans, two vastly different constituencies, in order to prevent Democrats from being competitive in the rest of the state. Cassidy was one of eighty House Republicans who signed a letter urging his leadership to use the Continuing Budget Resolution as a way of holding the implementation of the Affordable Care Act hostage by threatening a government shutdown. Two other Louisiana Republicans signed onto the letter: Steve Scalise, whose position in Congress is also attributable to tortured gerrymandering, and John Fleming, the guy who dressed up in a doctor costume for Eric Cantor’s press conference. Fleming, it is worth noting, was first elected to Congress in 2008 after defeating Democrat Paul Carmouche by only 350 votes, in an election that attracted over 92,000 voters, a pertinent fact that seems to be curiously missing from Fleming’s Wikipedia page. The conventional wisdom suggests that Fleming’s district, Louisiana’s Fourth, is reliably Republican, but there is ample reason to believe Fleming would have lost his first election to Carmouche, the Democrat and a popular, long-time district attorney, had Carmouche not alienated progressive voters, during the waning hours of the campaign, by staking out a hard-line position against gay marriage. Fleming was perceived to be a weak candidate, despite the fact that he was independently wealthy and a medical doctor. If, like me, you’ve followed John Fleming’s career in the United States Congress, particularly his actions during the recent government shutdown, then you should understand why he barely won election in 2008. Fleming may be a doctor, but he’s made his fortune as a curator of sandwich art. He owns several Subway franchises, and he caught some heat, a few years ago, by requiring his employees to insert campaign pushcards in to-go orders. When President Obama attempted to roll-back the Bush-era tax cuts on people making more than $1 million a year, Fleming, a multi-millionaire who makes over $600,000 a year after taxes, complained about the difficulty of putting food on his family’s table. Put another way, John Fleming makes 19 times more every year than his average constituent, but he and his family can’t stomach a 1% tax increase. More than anyone else in Louisiana’s Congressional delegation, this man, John Fleming, has become a leading voice for repealing and defunding Obamacare, even if it means putting the federal government out of work and causing a worldwide economic recession. That’s right, Louisiana, John Fleming is your intellectual powerhouse in this epic battle. John Fleming, the multi-millionaire who complains about only having $400,000 left to play with every year after spending $200,000 a year “feeding” his family, is your champion for the working poor and the uninsured. John Fleming, a man who represents a state that suffered for far too long from the horrors and injustices of institutionalized slavery, wants you to know how bad Obamacare is: According to him, Obamacare is “the most dangerous law” ever passed in the history of the United States, narrowly defeating (one can only hope) the Fugitive Slave Act and more than a century of Jim Crow laws. In fact, according to John Fleming, his fight against Obamacare is just like fighting against slavery. I hate to be the first to break it to you, Louisiana Republicans, but you don’t even know what this battle is about. Your party, your preferred media, and your elected officials have somehow convinced you that expanding health care coverage is unpatriotic. Most of you are poor; most of you work paycheck to paycheck. Many of you are uninsured. You live in the least healthy and poorest state in the entire country. I’m not trying to suggest that racial and classist bigotry are exclusively informing the Tea Party’s solipsistic perspective, but it’s a huge part of it. And the third (strand) is the most important and elicits the most passions among Evangelicals and Tea Party Republicans – that big government is meant to create rights and dependency and electoral support from mostly minorities who will reward the Democratic Party with their votes. The Democratic Party exists to create programs and dependency – the food stamp hammock, entitlements, the 47 percent. And on the horizon—comprehensive immigration reform and Obamacare. Citizenship for 12 million illegals and tens of million getting free health care is the end of the road. These participants are very conscious of being white and valuing communities that are more likeminded; they freely describe these programs as meant to benefit minorities. This is about a Democratic Party expanding dependency among African Americans and Latinos, with electoral intent. That is why Obama and the Democrats are prevailing nationally and why the future of the Republic is so at risk. Government (they believe) is catering to those who have not earned their benefits or the freedoms of this country. (Those in the Tea Party) freely talk about food stamps, “welfare recipients,” and illegal immigrants. These groups are the most anti-immigrant, anti-food stamps, and anti- Obamacare and its potential beneficiaries of the Republican groups. They are also the most anti-Obama, anti-Obama agenda and anti-Obama politics—because these threaten the basics. Maybe this isn’t polite, but I’m friends with enough Louisiana Republicans and I know what they post on social media, every single day. The simple truth is, many of them hate President Obama because he’s black. Some of them think he’s a Kenyan-born Muslim. Or an Indonesian named Barry Soetoro. They may not say this “in public,” but in the comfort of their carefully-selected online audience, they are more willing. The tired tropes of racial “otherness” can only be effective, as an attack, among those who cling onto existential fear. 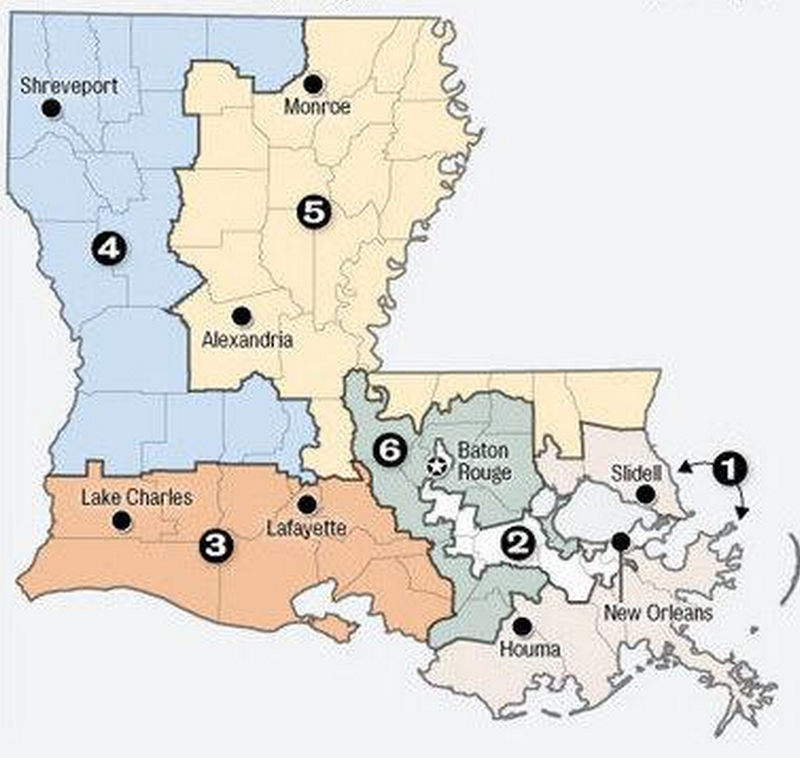 Louisiana, it turns out, is gloriously and amazingly diverse yet paralyzed by division, a division that has actually become codified by redistricting. Mitt Romney, after all, implemented the same freaking health care plan when he was Governor of Massachusetts, and many Louisiana Republicans campaigned for him (including Governor Jindal), actively; some of them even gave him money. Suddenly, Obamacare is worse than slavery? Aside from being poor and being led, almost entirely, by white Republican men, what else do states refusing to implement Medicaid expansion have in common? The vast majority of them were in the Confederacy, and the Medicaid expansion program if implemented in every one of those states would disproportionately benefit poor, uninsured African-Americans. Instead of embracing reforms that protect and empower the poor, the disabled, and the disadvantaged, Republicans are animated by a belief that helping the poor undermines their political power. If you don’t think the vestiges of institutional racism are still alive in Louisiana, you’re not paying attention. Louisiana has rigged the system against minority representation. Its elected officials are actively and publicly fighting against implementing reforms in health care that would save the state billions of dollars while, at the same time, also ensuring coverage for hundreds of thousands of poor and working class families. Again, it’s insanity. Governor Bobby Jindal, for what it’s worth, has never plunged into the deep end quite like Congressman Fleming; he’s never suggested that health insurance is worse than slavery. But Jindal, an obviously smarter politician and more of an intellect than Scalise and Fleming combined, has done more than any other single person in modern Louisiana history to prevent poor, disabled, elderly, and sick people from accessing health care. When he was 24 years old, Bobby Jindal was appointed Secretary of the Louisiana Department of Health and Hospitals. He spent his two years at DHH slashing services and closing clinics, and somehow, Republicans thought this made him an expert in health care policy. He spent the next couple of years of his career advising President Bush on Medicare reform, the result of which was a $550 billion entitlement program that subsidized the pharmaceutical industry and prevented the federal government from negotiating the cost of prescription drugs. Today, Jindal continues to terrorize health care in Louisiana. His most recent Secretary of DHH is under investigation for colluding with his former employer in order to award them with a mega-million dollar state contract. Much as he did when he was at DHH, Jindal is closing health care facilities, charity hospitals, and clinics all over the state. He’s spending public money to privatize hospitals and turning them over to untested and, in some cases, unprofessional operators, and he’s slashing money to pay doctors, nurses, and care providers in state-run facilities. Earlier this year, Jindal vetoed $2 million in funding to help severely disabled people pay for hospice care, while also approving more than $40 million to subsidize churches operating unaccredited and unregulated schools. Two former secretaries of the Department of Health and Hospitals called on Gov. Jindal to do the right thing and take the almost $16 billion in new Medicaid money for Louisiana. And yet, in one of the poorest and unhealthiest states in the union, Gov. Jindal has held firm to his rejection of the money that could help thousands of residents. The state estimates that 214,000 uninsured residents could get coverage under the Medicaid expansion. In New Orleans, primary care clinics that have flourished post-Katrina need the federal money to continue operating long-term. Despite the governor’s arguments otherwise, it makes financial sense for the state as well. The nonpartisan Legislative Fiscal Office’s analysis found that Louisiana would save between $532 million and $544 million over the first five years of the expansion. The fiscal office estimates the state would save between $185 million and $510 million over 10 years. Gov. Jindal’s own Department of Health and Hospitals found that the state would save as much as $367.5 million over the first 10 years of the expansion. DHH’s worst-case scenario is that Louisiana would have to spend as much as $1.71 billion over a decade. Under the Affordable Care Act, the federal government would provide Louisiana with 100% of the funding needed to implement Medicaid expansion for the first three years of the program; by the end of the decade, the state would still only be responsible for 10%. And again, according to the Legislative Fiscal Office and Jindal’s own DHH, this would likely save taxpayers hundreds of millions of dollars. The DHH’s “worst-case scenario,” a loss of $1.71 billion over ten years, is still good policy: $171 million a year to ensure that families who make less than 138% of the Federal Poverty Level is an investment in our workforce, an investment that provides higher returns than anything Stephen Moret and Jindal have ever funded through the Louisiana Economic Development Department. Bobby Jindal is not a health care expert. He’s more like an arsonist. And for what? Why? He’s not making Louisiana any healthier, wealthier, or more productive. Our priorities are all wrong. Jindal’s opposition to the Affordable Care Act isn’t grounded in economics; it’s about burning down, once and for all, the populist legacy of Huey P. Long. It’s about destroying institutions and programs created by Democrats to protect and empower our most vulnerable citizens– schools and hospitals, libraries and clinics. Louisiana Republicans, like many in the national GOP, seem to believe that any government subsidization of health insurance would have the ancillary benefit of making millions and millions of Americans more loyal, politically, to Democrats. So they would rather deny Louisiana $16 billion to which it is legally entitled, not because it’s good policy to do so but because it’s politically expedient, particularly when you’re attempting to assuage a base comprised almost entirely of hard-line, white, rural evangelicals who believe their privilege, power, and influence over the American political process is threatened by massive changes in demographics and culture (a fear that, to them, is perfectly symbolized and embodied by Barack Obama). So health care is like slavery. And President Obama’s $16 billion offer to Louisiana must be refused. 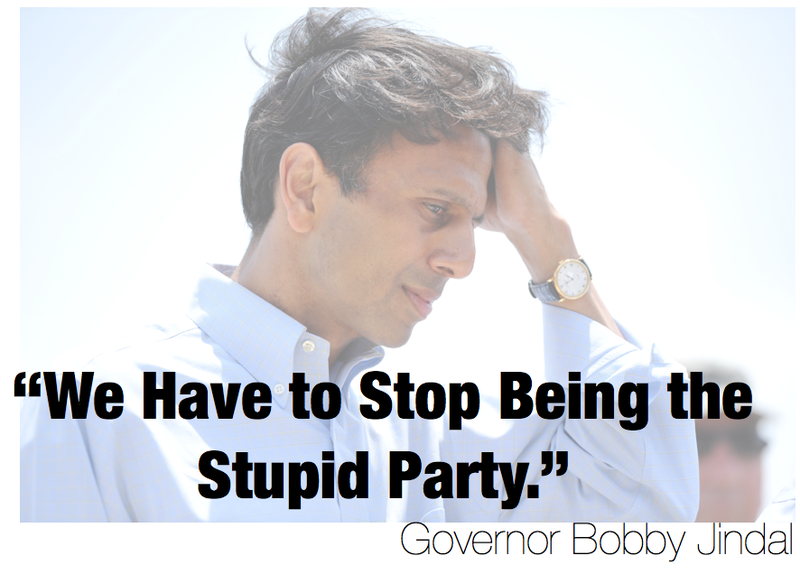 But don’t worry about us: Bobby Jindal has this great plan. He’s going to eliminate income taxes for the wealthy, while raising sales taxes in order to pay private, unregulated, out-of-state companies to run the state government. After all, an economy built on disaster capitalism requires disaster. Epic. Damning. Only the beginning. CenLamar’s @LAGOP takedown. If you want to really see something, go to Flemings/ our official Face Book page, that those of us who consistently oppose him, are banned from…..he controls the message full of incompletes and misinformation…….he is a piece of work, and needs to be voted out, ASAP…. An excellent article. 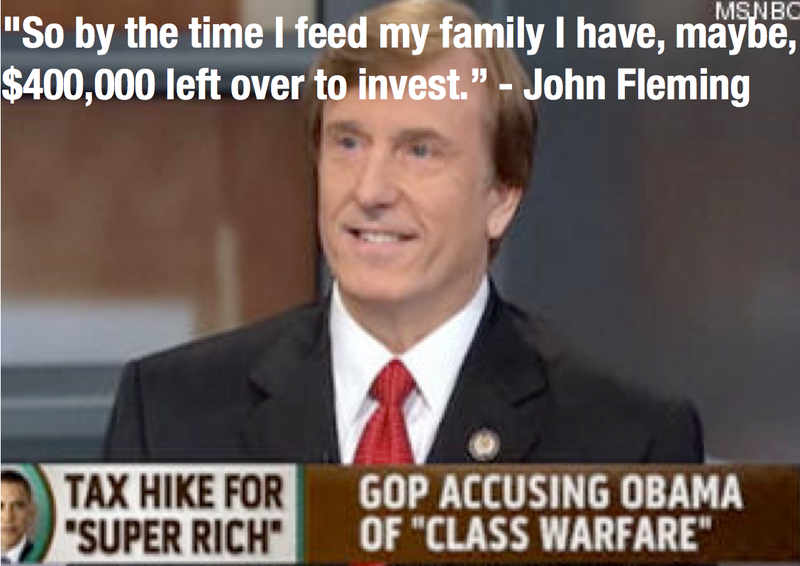 John Fleming is the epitome of what is wrong with wealthy Republican politicians. He doesn’t think for himself or the people of Louisiana, he is strictly a right wing conservative Tea Party puppet. One would think a medical doctor would be inclined to be concerned about people and intelligent enough to be able to help them, but he has turned his Hippocratic oath into a hypocritic oath pledged to the Tea Party. When he violated my freedom of speech by banning me from commenting on his public Facebook page, he lost any respect I had for him, so much so that I refuse to call him, Mr., Dr., Congressman or Representative Fleming because he has not earned any of these titles. I keep seeing the tag, “wealthy” when used to describe anyone in the GOP/Tea Party, but the truth is all the wealth is in Hollywood and NY, where two or three summer blockbusters could get us out of debt. Let us talk about the rich “Dem/Libs” who mostly live in the highest over-populated cities, the ones (cities) that spew the most pollution, and eat up the most resources, and have the poorest health systems. I’ve lived in LA, and Tex and had great STATE funded health care. There isn’t any pollution out in the country. Me personally, I think both parties are so off point that the only reason they are needed is because they have the ability to make themselves so. I need healthcare and Obama has allowed me to get it with pre existing conditions, but I will pay for mine and DO NOT want to pay for crackheads a smokers health care. Um, would that STATE funded health care be in the form of medicaid or were you a state employee or something like that? This article needs to be a talk on every media throughout the state and country. I plan to use the facts when I write to the papers. We must find a way to reach the hearts and minds if the low income whites who vote against their own interests. Some ignorant of the fact and some who will not change even when they understand their financial benefits but cling to their Jim Crow beliefs. I have hope we will prevail. In 2016 our 15 yr old progressive youth will become of age and rebel at the voting booth. A super excellent must read article!!! Hi Lamar. I honestly couldn’t tell you how Obamacare is going to affect me personally, because I have insurance through my employer. But, I have a friend with a family of 4, who currently brings home roughly $24K a year. He has, until now, opted to forego health insurance for himself and his wife because of high costs. His kids are covered by Medicaid. 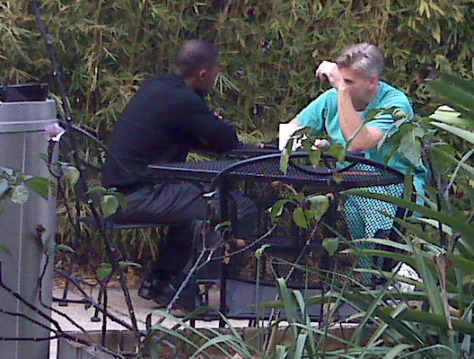 Under Obamacare, his health insurance premium would be just a little over $600 per month. That’s considerably more than the amount he pays each month on the single-wide trailer he lives in. Maybe you have a different take on that, but I would not call that affordable as the name of the act suggests. And I also fail to see how it will “fix” health insurance. If anything it seems to be more geared toward increasing profits for the insurance companies. Don’t get me wrong here, I’m all for healthcare reform. Hell, I’ll take socialized medicine. Bring it on. But with Obamacare as it is, I fail to see the big benefit.